Finding understandable wine information is challenging. The world of wine can seem overwhelming and pretentious. Hey! I get it. I’ve worked in winemaking for years. Let me bring wine to your table! From simple, but interesting wine tidbits to details explaining under-explored wine regions (likely from YOUR home state). Denise Gardner Winemaking has something to offer you regardless of how much you already know (or don’t know) about wine. Subscribe to the bi-monthly newsletter, covering wine production and wine pairing information. Follow @dgwinemaking on Instagram, which is PACKED with lots of educational tidbits to make you more wine savvy. BONUS: I routinely feature some of the best wines I’ve tasted from various states across the U.S. Follow @dgwinemaking on Facebook for more regular news postings about the wine industry. 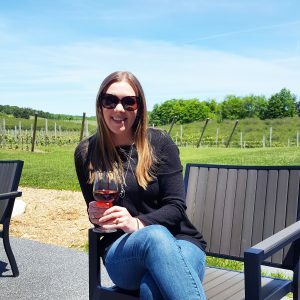 Read the “Som Series” blog posts that discuss wine and food pairings, planning events with wine, and featured wines I enjoy. Enjoy wine purchasing tips for holidays: New Years, Valentine’s Day, Passover, Easter, Summer [Vacation], Oktoberfest, and Thanksgiving. Want me to cover a new holiday? Or update another holiday? Direct message me on Instagram, Facebook, or email. Find delicious Pennsylvania wines and enjoy them with family dinners using my “Bring Wine to Your Table” wine-pairing guide. Building a wine-and-food pairing guide for your home state. See my Pennsylvania wine example here. Helping a bride and groom select a special wine(s) for their wedding ceremony, as a guest book, and reception. Selecting wines for rehearsal dinners (rehearsal dinner 1, rehearsal dinner 2) and special events (event 1, event 2). Denise, enjoying a glass of wine in the Leelanau Peninsula wine region (MI).